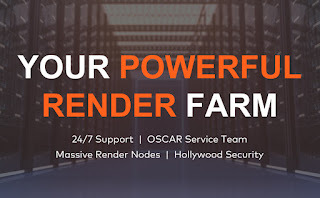 Fox Renderfarm is a leading render farm service provider for CG artists all over the world. With more than 70,000 customers, including two Oscar winners, Fox Renderfarm has earned a good reputation for its quality performance, great customer service and flexible pricing scheme. Fox Renderfarm supports most of the mainstream 3D software and renderers, with the easy to use desktop app, customers can easily drag and drop their project files to upload to our server. The project will be automatically analyzed and rendered by thousands of rendering nodes. The embedded IBM Aspera transmission engine ensure high-speed uploading and downloading. As the partner of SIGGRAPH, Fox Renderfarm has sponsored the SIGGRAPH Student Volunteers Program to express their strong willing to help CG industry students and creative teams who lack rendering power. By offering free render credits and up to 60% off discount to them, more and more students and creative teams fulfilled their dreams by being part of Fox Renderfarm’s GoCloud Program. BTW, their latest released campaign “Fox’s Got Talent” has attracted lots of CG artists to submit their work to win free render credits, don’t hesitate to share your artwork, you might be one of the lucky winners!